A soldier returns home from Vietnam and is having a tough time adjusting to life after war... years before PTSD was "discovered". Natalie: Is this the end of the world? Chris: Maybe for some... but not for us. 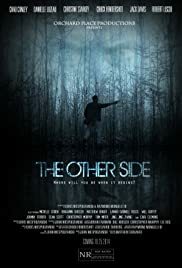 I had the pleasure of seeing this over the weekend and must say if you can see one movie this Halloween season I highly recommend seeing "The Other Side." From start to finish the movie keeps you on your toes, and it is not what you would typically expect from a zombie movie. Great plot, lots of action, and plenty of surprises to keep you engaged throughout the duration. Chad Conley and Rob Liscio's performances standout as "Chris" and "Joe" two of the lead characters who you will find yourself pulling for during the film... I'm sure you will be seeing more of these two in the near future!! Great job Orchard Place Productions for creating a quality film with a great soundtrack and incredible cast!